The European Bluegrass Blog: Fingerstyle guitar workshop weekend in Ireland, 18-19 Apr. Fingerstyle guitar workshop weekend in Ireland, 18-19 Apr. The 2nd Annual Fingerstyle Guitar Workshop Weekend will be held on 18 and 19 April 2009 in Raughley, north Co. Sligo, Ireland, from 10.00 a.m. to 5.00 p.m. both days. This is a two-day intensive workshop, geared towards improving the existing skills of fingerstyle guitarists. The tutor for this event will be Mr Duck Baker (USA), a legend in the world of fingerstyle guitar. The cost of the workshop weekend is €90 per person. The workshop weekend is this year grant-aided by Sligo County Council, under the 2008 Arts Grant Scheme. For more information contact Ron on +353 (071) 9163669 or by e-mail. In conjunction with this workshop Duck Baker will be playing a concert in the Factory Performance Space, Lower Quay Street, Sligo, on Sunday 19 April, starting at 8.00 p.m. Tickets cost €15, or €12 for concessions. 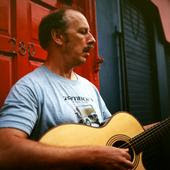 Duck Baker plays fingerstyle guitar: blues, jazz, ragtime, swing and Celtic music. Booking and information +353 (071) 9170431. Duck Baker has released twenty solo albums since 1976, has appeared on many others, and has had ten books of guitar music published. Full details can be seen on his website and his music can be sampled on his MySpace site. Sing Out! magazine described him in 2005 as 'quite simply... the premier American fingerstyle guitarist'.